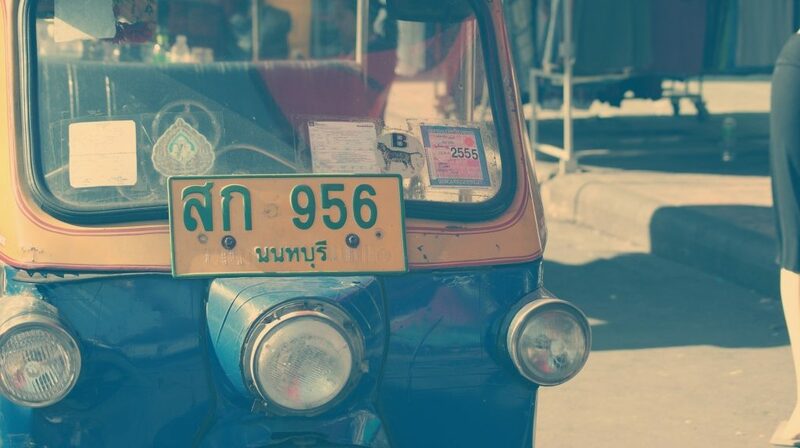 When you buy a motorcycle or car in Thailand you need to transfer the ownership of the vehicle to your name. Do not listen to anybody who tells you it can’t be done or tries to dissuade from doing so. It’s not even difficult to do if you’ve got everything you need. The title transfer needs to be done at the Land Transport Office. In Chiang Mai, there are two different offices. The location of the first office is on Lamphun Road, just east of the river, right across from a large bridge that makes a T-junction next to the Holiday Inn. This is the office to go to for transferring the title of a motorcycle and for paying your yearly vehicle tax. The second Land Transport Office is located on Hang Dong Road just past the airport if you’re heading south from the center of town. This is the office to go to for transferring the title of an automobile, and it’s also where you go to get a driving license. Now that you know where to go, let’s look at what you’ll need to bring with you. The seller does not need to be present so long as you have the required signed photocopies of their ID and their signature on the title transfer application form. It is always a good idea to dress politely when visiting any government office in Thailand. You must take the vehicle in question with you to the Land Transport Office because they will need to do an inspection. Hand over all your paperwork to the person at the information desk, and they’ll check if you’re missing anything. They’ll then direct you to the inspection area, where the inspector will quickly look at your bike. After this, you need to go to the little room out front of the Land Transport Office where insurance is sold. The minimum required accident insurance that you need to buy is ridiculously cheap—in the neighborhood of 300 baht. Once you’ve got the insurance paid for, you can hop back in the Land Transport Office and hand over all your paperwork once again. This time you’ll be given a number and told to return the next day to pick up the updated vehicle owner’s booklet. When you come back to pick up the owner’s book, there is a small fee of around 200 baht, and you might also have to pay vehicle tax at this time. If the vehicle tax is paid up to the current date, though, you may not have to pay it yet. If you have to pay, it’s about 100 baht per year for a bike. Make sure you’re aware of the paid-up-to date on your vehicle’s tax sticker. It is indicated by the initials for the month in Thai writing, so ask a Thai friend for help if you can’t read it. You’ll need to return to the Land Transport Office before this date to pay the annual tax and purchase insurance. Every couple years they also request your vehicle to get emissions checked, which can be done at the private checking station located right next door. Payment of the vehicle tax is indicated by a small square card that you can stick to the windshield of a car or somewhere on the body of a bike. This card is not actually a sticker, so you have to purchase a clear square sticker to apply it to your vehicle. Optionally, some bikers keep the tax card rolled up in a small clear cylinder that attaches to the bike. There is a small shop by the Land Transport Office parking lot where a man sells both of these quite cheaply. Traffic police checkpoints are very common. They routinely pull aside everyone driving a bike to check if they have a proper driving license. 99% of the time you can just smile and show them your Thai driving license, and you’ll be on your way again in under 30 seconds. They are also checking for the vehicle tax, so it’s good to have the tax-paid card displayed in a very visible location. Some people have said that traffic police asked to see the vehicle’s ownership as well. For this reason, you should always keep a photocopy of the owner’s booklet under the seat of your bike or in the glove-compartment of a car. I would not recommend keeping the original there, however, because then if the vehicle is ever stolen you’ll have no proof of ownership to show to the police.